I've been thinking about making a whole new stash of bibs for number 3. Since finding out we are having a boy, I've decided it really is high time I got rid of all the grotty and girly bibs (sorry Tim that you've been stuck wearing them!) and perhaps made some new ones. Having had really spilly kids, we've always gone through a bundle of bibs a day - and rather than spending $10-15 each on some lovely new ones, I'd like to try to make some myself. But I've NEVER been a sewer. Although I like to think most teachers would remember me fondly, I think my sewing teachers would probably not remember me at all. I only took sewing in 3rd form for 1 term, and of course 2 terms over the course of my intermediate years. I seem to recall making things like pillowcases and drawstring bags, and perhaps the odd needlebook or pincushion. Perhaps even a pair of shorts? I also recall getting a bit frustrated and stuck. 4 generations - ooooh, look at how cute the kids were! So, I should be able to sew some bibs right? I've even found a tute that makes sense here. Isn't the internet a wonderful thing! Information at the touch of a button! Tomorrow's mission - to find some left handed dressmaking scissors. Julia if you want to try a rotary cutter I hardly ever use mine so you can borrow it any time. And yay for finding a tute online. I can't use my rotory cutter for cutting curves, maybe I'm just spesh LOL but I'm sure Spotlight will have left handed scissors. I only did form 2 sewing so if I can pick it up again this late in life then I'm sure you will (and do a fantastic job at that). Its in your genes, you'll be fine! Great! And good luck! So you have a machine? Yes it IS in the genes! As far back as you like. Mum DOES still sew, at 91 and unable to see to thread the needle, but she still mends and sews a bit, doesn't make coats like she did up until about a year ago though. Her twin was a tailor who tailored all the suits for the Official Party when the Queen visited NZ in 1952, and he had a photo of them on the wall of his "workshop" and a letter of thanks. Back in the mists of time, when I did the Price family tree (Mum's paternal family) there they were - Walter Price and his father William Price, were the Tailors of Stroud, in Gloucester. It's always reminded me of Beatrix Potter's story about the Tailor of Gloucester!! Your Aunty Annette does amazing patchwork and Aunty Zeet was a wonderful sewer back in the day too! 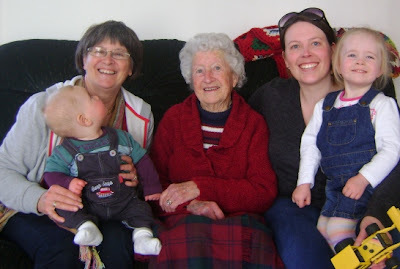 and Gran (my Gran, Jessie Pfanz, married to Albert Price) made beautiful things, more into beautiful than money-saving, but quite capable of both. At 88 yrs old when her sight was virtually gone, she was very frustrated that she could not longer crochet or tatt with very fine cottons, she used to use a 60 or 80! (I've only ever used 20 or occasionally 40!) So there's the family history from that point of view!! Nope, no machine yet mum!